Cancer treatment ‘spin out’ start-up Phion Therapeutics, founded by Professor Helen McCarthy from Queen’s School of Pharmacy, has been crowned winner of this year’s InterTradeIreland Seedcorn Investor Readiness Competition, scooping a top prize of €100,000. Launched in May 2017 after years of research by Professor McCarthy and with the support of Boston entrepreneur David Tabaczynski, Phion Therapeutics specialises in a novel drug delivery platform based on cell penetrating peptides. Earlier this month the Belfast-based firm won the Best Early Stage Company Award in the Northern Ireland regional heat of the competition. The winning companies from each of the four regional finals competed in the all-island grand final on Wednesday 22 November at the Crowne Plaza in Dublin. Phion Therapeutics sells services (contract research) and licenses (the right to use their technology for pharmaceutical development and therapeutic applications). In what has been a phenomenal year, the company was previously named overall winner of the Invent Awards 2017 – Northern Ireland’s innovation oscars. Speaking about her latest achievement, Professor McCarthy said: “It’s a huge honour to win the Seedcorn Investor Readiness Award, not just for me and for Phion Therapeutics but also for the School of Pharmacy and Qubis at Queen’s. After 11 years of dedicated research, 2017 has been just phenomenal for Phion! 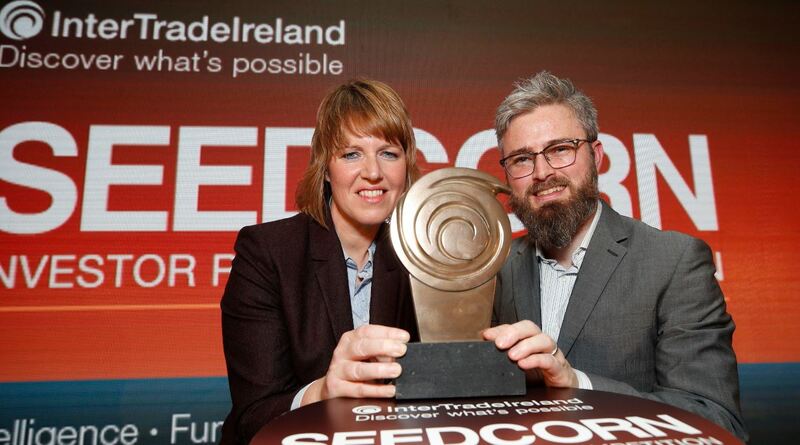 “With almost 300 companies challenging for the top award from a range of sectors, Seedcorn is a very important competition for new start-ups and early stage companies such as ours. Now in its 15th year, the Seedcorn competition is aimed at new start and early stage companies which have a new equity funding requirement. It has an overall cash prize fund of €280,000, with no equity stake. Since it started in 2003, the 2775 companies that have gone through the competition have raised over €229m. The biggest business competition for new start-ups and early stage companies from the island of Ireland, those competing included firms from the medical device, technology, fintech, design engineering and diagnostics sectors. Welcoming the successful conclusion of InterTradeIreland’s Seedcorn competition, An Tánaiste and Minister for Business, Enterprise and Innovation, FrancesFitzgerald TD, said: “I heartily congratulate this year’s winners and I want to thank InterTradeIreland for organising this event. “Securing funding can be a challenge for early stage companies and, while there can only be two major winners of the generous Seedcorn Competition funded by InterTradeIreland, all 276 companies which participated in the process will have benefitted from the competition and should now be a better position to pursue outside investment as their companies develop. I wish them all the very best for the future”. Caption: Phion Therapeutics founder Helen McCarthy with Qubis spin-out manager Darach Neeson. Photograph courtesy of InterTradeIreland.